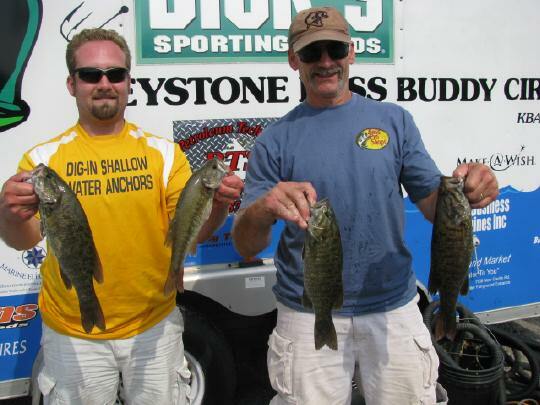 Last Saturday was the final regular season tournament in the Keystone Bass Buddy Circuit (KBBC). Dad and I decided that because we were sitting in 11 place in the standings we were going to take an all or nothing approach to fishing the event. Which meant to us that we were going to try to lock twice. I know a handful of guys risk doing this every year and some guys make it back on time and some don’t. What we had decided is that no matter what we were going to start locking back up at 11:00, even though the tournament hours were until 3:00. We would start locking with or without a limit. The tournament started at 6:30 and we ran to the first lock, and when we pulled up to it the doors started to open! We were very excited because this meant no wasted time. Once we got through that lock, we quickly ran to the next one. Another boat went up and pulled the chord so we stopped short to make a few casts. I think we were able to make 4 casts and they opened the gates again! Never in my wildest dream did I expect to have both locks line up and let us get to our spot by 7:40. I knew then that we had a better chance to do well. Our first spot was a creek mouth that I had practiced the week before and caught a number of keepers and dinks. Turned out to have more dinks than keepers during the touranment, but we were able to get 2 keepers from the spot. One decent keeper and one that was around 12 3/4″. Then we ran to a spot that I found were there was a metal wall, but there were a series of rock humps and wooden structure that was submerged. We got to that spot and I immediately caught a small keeper. It was around 12 1/4″. About 5 minutes later I caught a really nice 15″+ smallie. That would be the last of the keepers for that spot. We fired up the boat again and ran to another spot by a couple of barges. Quickly dad caught our lunker smallmouth for the day and another keeper spotted bass. At this point we were really excited because we had our limit and it was only 10:30. The problem was that we were out of spots that produced for me in practice. We ran around fishing quickly for about 30 minutes looking for fish but nothing happened. So we decided to lock back through to the next pool. Like clock work we were able to lock right up through and quickly ran to a spot we had caught them in practice. Once we locked back through we were able to catch 2 more keepers. One that culled and one that didn’t. One was off of a rocky bottom and the other was off of an old metal structure. We locked back through to the southside pool around 1:00. A 2:35 dad got a good bite, but the fish jumped and trashed away from the boat and was able to get off. The fish would have culled, but I think it may have only been able to move us up 1 or 2 places in the standing. Overall, it was worth the gamble for a couple of reasons. First, we made it back on time. Second, we got away from the crowd. Third, we had decent fish located. Forth, we really had nothing to loose. Seven of the eight keepers we caught were on weightless stick worms. The stick worms were ones that I make myself that are very soft and are a slightly different brown color than most companies make. The other keeper was on a beaver that was green pumpkin that I made myself as well. I am a believer in making baits that no one else has and it has really paid off for us this year. Congrats to Chuck Walker Jr. and Chris Covert for winning the points title for the year. Their 6th place finish shot them up to the top. August 24, 2011 Where Have I Been? Hey man. I have a small club tourney coming up this saturday the 24th and we are fishing the 3 rivers. We launch at the 18th street launch on the Mon. Could you please give me some pointers or some places that you have fished that would be productive for me? its only a 6 hr tourney and I have no clue where to even start. I have never fished there before. My email is jtmoslak@gmail.com. thanks!! Sorry I didn’t get back to you. i had surgery the same day you asked for advice, and i only can type with my left hand. i know the tournament is over but i will send you some info in a couple weeks. I will do the trip for saltwater fishing to NJ shore for the stripe bass fishing. We will live Pittsburgh, South Hills Friday morning Oct 21st and coming back Monday morning. This is greatest time for stripe bass! We will meet more anglers from PA at Island Beach State Park. Fish together, eat together, have a fun together. This is a fun and get together trip!